Governor Whitmer has set her agenda for the next year during her first State of the State address before the Michigan Legislature at the state capital. 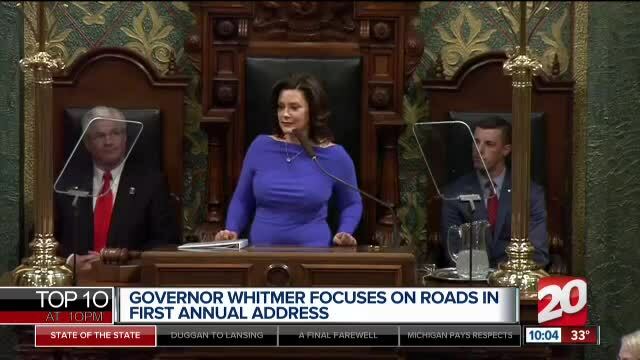 (WXYZ) — Governor Whitmer has set her agenda for the next year during her first State of the State address before the Michigan Legislature at the state capital. The speech tackled the themes of facing Michigan's growing challenges, making state government a government that works for everyone, getting a strong, healthier economy, a budget that addresses our problems, and establishing "Foundations of Faith in Michigan's Future." 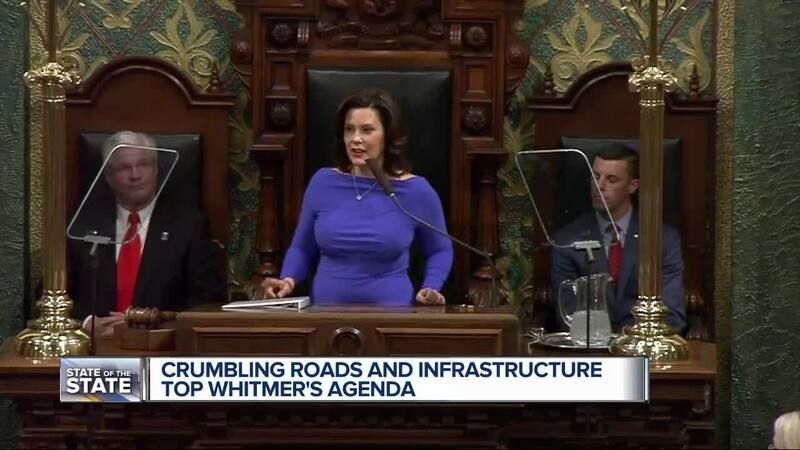 After beginning her speech by celebrating the diversity in Michigan's state government, Whitmer told legislatures that they are facing two major crises, the first of which is infrastructure. Whitmer cited a 2018 study by the American Society of Civil Engineers that gave Michigan's infrastructure a D-plus, with our roads actually receiving a D-minus. Addressing the study, Whitmer said, "Let's be honest: We don't need studies to tell us this. The evidence is impossible to ignore." She went on to say, "And while it's hard to imagine things getting worse, that is precisely what will happen if we don't act boldly and swiftly. Because over the next decade, the share of Michigan highways and trunk lines in poor condition will more than double - worsening the severity of the danger and costing drivers across our state even more. It endangers our lives. And robs us of our time and our hard-earned money." Whitmer then called on people across the state to take to social media to highlight the problem, using the #FTDR hashtag. However, she did not put forth any proposals to improve the roads during the speech. The next infrastructure problem she tackled was Michigan's water infrastructure, citing the dangers from both old pipes and toxic chemicals such as PFAS, saying "From our roads to our water, infrastructure is the crises - we see it in our commutes, in our communities, and in our homes." Whitmer then tackled the state's problems with education, citing the statistic that our state's third graders rank in the bottom ten in the country for reading. "Let's be clear: This is not happening because Michigan kids are less talented," Whitmer said. "It's not happening because our kids are less motivated. It's not happening because our educations are less dedicated. It is happening because generations of leadership have failed them." Whitmer also called on the legislature to adopt hands free laws across the state and expand the Elliott-Larsen Civil Rights Act to cover the LGBTQ community. Whitmer is also calling for action that would increase the number of Michiganders with post-secondary education credentials to 60 percent by 2030, create the Michigan Reconnect economic-growth/workforce development program and create the Michigan Opportunity Scholarship. Michigan Reconnect is designed to assist workers in gaining skills and education, help employers find qualified talent, help displaced workers re-enter the workforce and market Michigan as a place with highly skilled workers. The Michigan Opportunity Scholarship would provide high school students with two years of tuition-free post-secondary education, which could be used at either community colleges, or during the first two years at public or private not-for-profits colleges and universities. 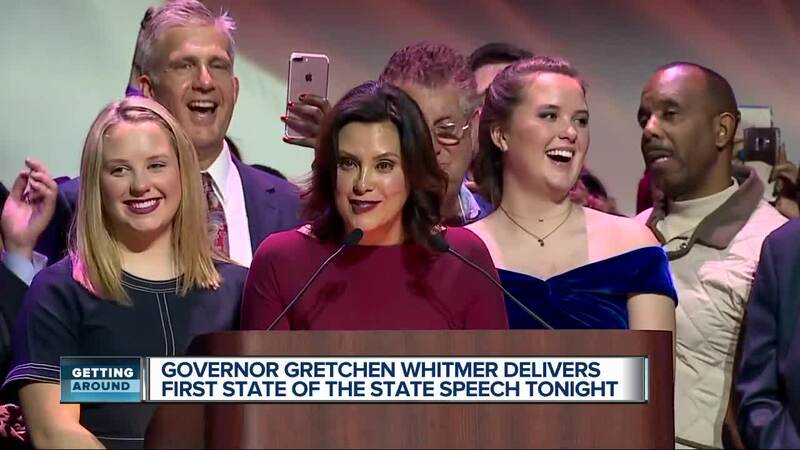 Whitmer's speech touched on the themes of building bridges, boosting morale in the state government, while making it more open, transparent and accountable, and building a stronger Michigan for everyone. She said some of the ways to do this is to expand the Freedom of Information Act to include the governor's office and the legislature, and calling on the legislature to enact legislation that would prohibit employers from asking a woman's salary history. In her first State of the State Address, Whitmer focused on building bridges and putting Michiganders first, saying, "I will not sign anything that resembles the budget gimmicks and band-aids that have failed us in the past. I will veto bills designed to cut out the public's right of referendum. And I will stay faithful to the mission of fixing the roads, improving skills through education and training, and cleaning up our water. And I'll work with everyone who wants to do that." She went on to say, "And one more thing: I pledge to continue the new culture that Governor Snyder created in Lansing over the last eight years: Budgets get done before the break. And that was a good thing. Because just like every other workplace, we shouldn't go on vacation until we get the job done." She ended with a call for bipartisanship, saying,"When we stand together as Michiganders - or Michiganians, for those of you who insist - we can get the job done for the people of our state. We can build drives and ensure that Michigan is the home for opportunity for generations to come." Whitmer then wrapped up the speech by saying, "So, let's get to work." The date for the State of the State was originally set for Feb. 2, but was rescheduled due to President Donald Trump's State of the Union Address.